A much more comprehensive list with individual numbers, is available in an appendix page, largely from Reg Carter's lists. It is clear that a job lot of surplus second-hand engines was purchased, with the brand new pacifics being the sole exception to this. The next photo, of the opening train at Puerto Deseado passing through a triumphal arch, shows one of the 4-6-0s listed above, reputed to be no. 163. 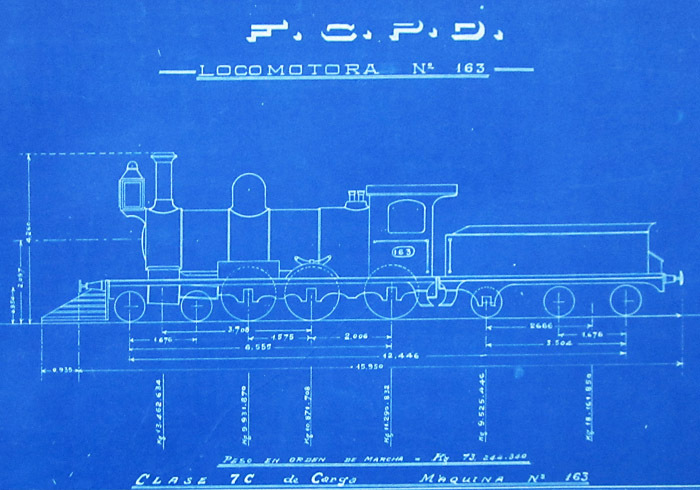 A volume containing loco drawings and many others is held in the archives above the railway museum at Retiro in Buenos Aires. We are grateful to the staff there for permission to copy and reproduce them. 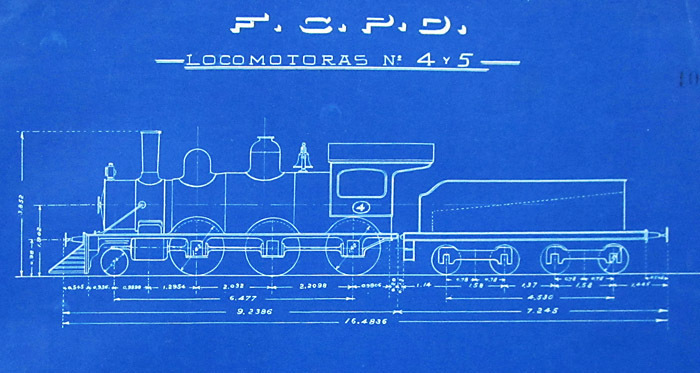 The drawings clearly date from the very earliest years of the Puerto Deseado railway, whilst everything was still under construction. 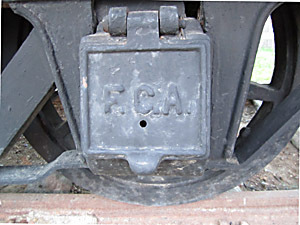 The locos in particular are carrying their early numbers from before the FCE re-numbering scheme. It should be noted that these drawings were photographed rather than scanned, so there may be some distortion in the reproductions. The originals in the volume were roughly A3 size and with neat borders and additional tables of critical dimensions. They have been cropped here to permit the main outline drawings to be reproduced at a respectable size. Nos. 610 and 614. 4-6-0s, of a batch of six, were ordered in August 1888 and built by Neilson and Co., Glasgow, 1889 (works numbers 3882-7). 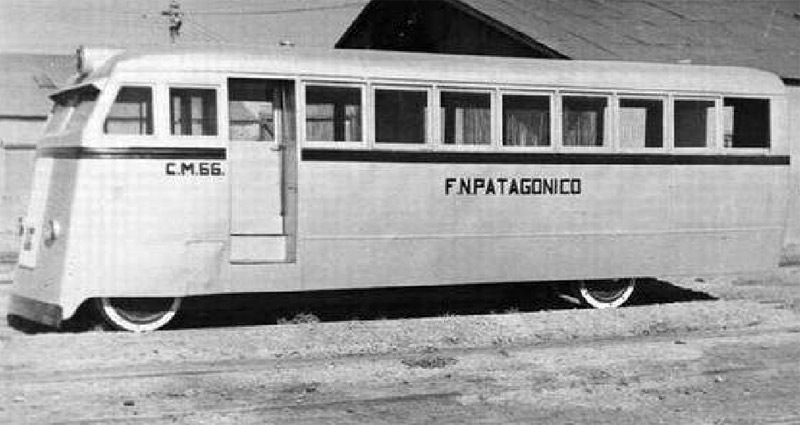 originally ordered by the Santa Fé and Cordova Great Southern Construction Company of the Argentine Midland Railway (supplied as AMR nos. 21-6), thence to BAR, and on to Central Argentine Railway. Purchased by FCE in 1910. The tender bogies had insside bearings. No. 163. 4-6-0 built by Sharp Stewart in Manchester in 1885 9maker's number 3229 or 3230). Purchased second-hand from the FCS, their class 7C. Originally from FC Buenos Aires y Pto. de la Ensenada. Nos. 4 and 5. Built by Baldwin in 1896 for the FC Andino. Purchased by FCE in 1909. Pacific locos, built by Cockerill and Haine St. Pierre for the state railways in 1910. No. 14, illustrated here, was renumbered 350. The photo below seems to show one of theCockerill-built pacifics at Puerto Deseado after an overhaul. The paintwork looks very clean; the tyres have been white-washed; but in addition the tender seems to have been extended upwards, a feature not previously noted. 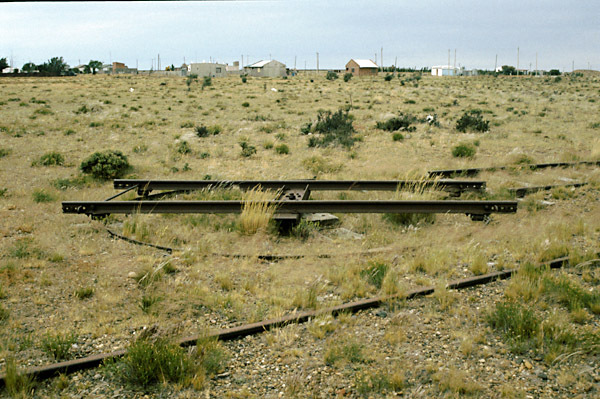 A pair of American style bracing bars seem to have been fitted from the smokebox to the buffer beam, possibly indicating a weakness in the original design. Incidentally, this image shows clearly the larger cab windows which enable the viewer to distinguish the Cockerill locos from their Haine St. Pierre compatriots. With the exception of the new pacifics, it rather looks as though the line was palmed off with whatever oddments could be found. 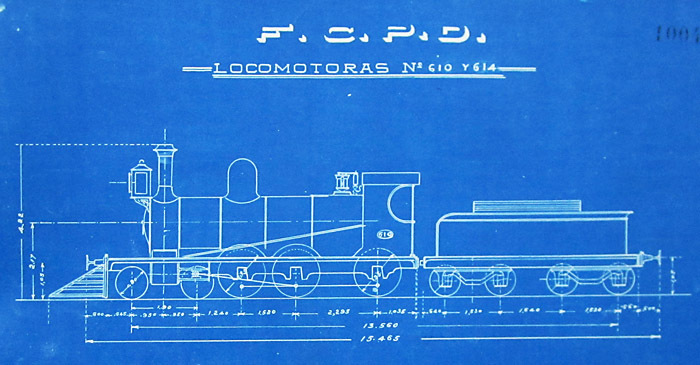 Since it must soon have become apparent that the railway could be worked by two or three locos at most, it seems likely that some of the above engines never worked in Patagonia at all. Presumable the newer surplus engines were shipped back north and any older ones were scrapped. Certainly by the time enthusiasts arrived in the early 1970s there were just four Class 12m 4-6-2s, nos 350, 351, 352 and 361 (2). Plates from FCE 1910 built pacific locos used on the line until its closure, as displayed in Puerto Deseado station museum. The works plate on the right is from loco 351, whilst the number plate on the left is obviously from 350. A photo from the Pto. Deseado station museum with the names of a few of the staff added. The picture is displayed here not for the pacific in the foreground but for the much rarer view of one of the other locos in the background. Although not certain, this may well have been one of the two Neilson 4-6-0s, no. 610 or 614. 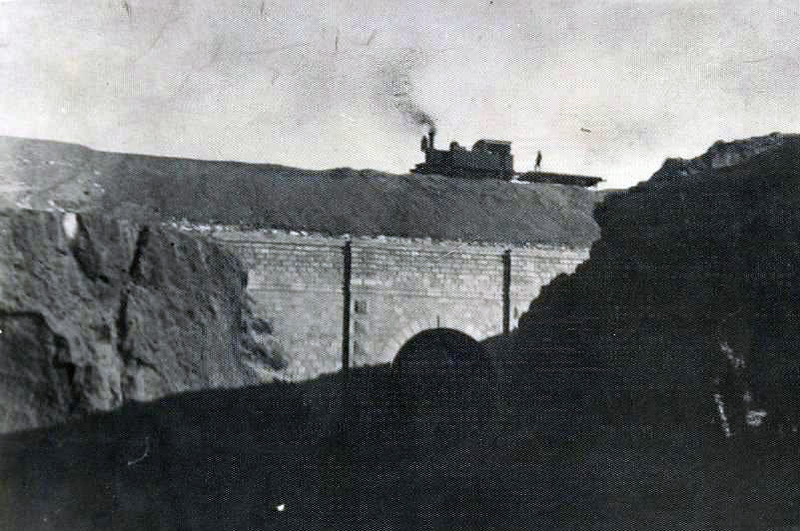 One puzzle has recently surfaced: the list of locos known to have worked out of Puerto Deseado does not include any tank engines, but here is photo of one such machine crossing over the stone under-bridge north of Puerto Deseado station. We wonder whether this might have been the unidentified loco no. 106 whose number-plate is depicted at the head of appendix 8. At least two of the cow-catchers from the pacifics survived the scrapping of the locos, presumably because they are largely of wood. These are now on display at the station museum. 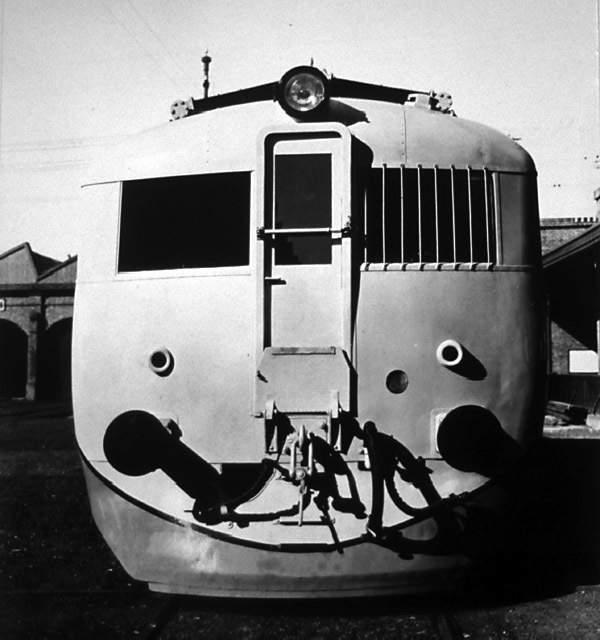 Attempts were made to reduce the costs of passenger trains from a very early date. A photo exists of a locally-made four-wheeled railbus for twelve passengers. Later there was a coche motor which suggests by its general design that it was constructed in the workshops at Puerto Madryn. This exists today and is displayed in front of the station museum. 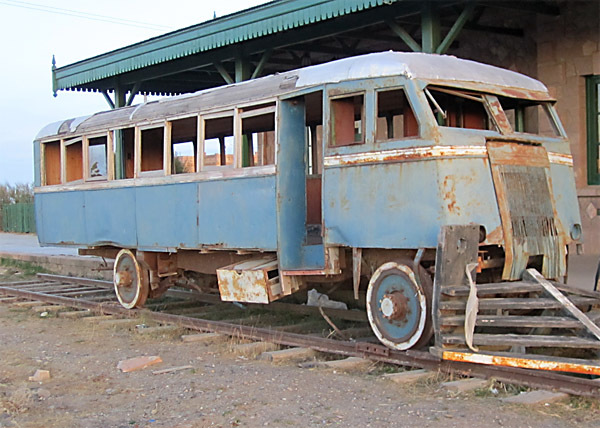 According to old railwaymen at Puerto Deseado in 2011 it owes its survival to its hardly ever having been used, having an excessively long rigid wheelbase. The Pto. Madryn built railbus, on a bus chassis, as displayed in 2011. The cow-catcher or pilot does not belong to this vehicle, belonging rather to one of the pacifics. From the BusARG blog we find these views. 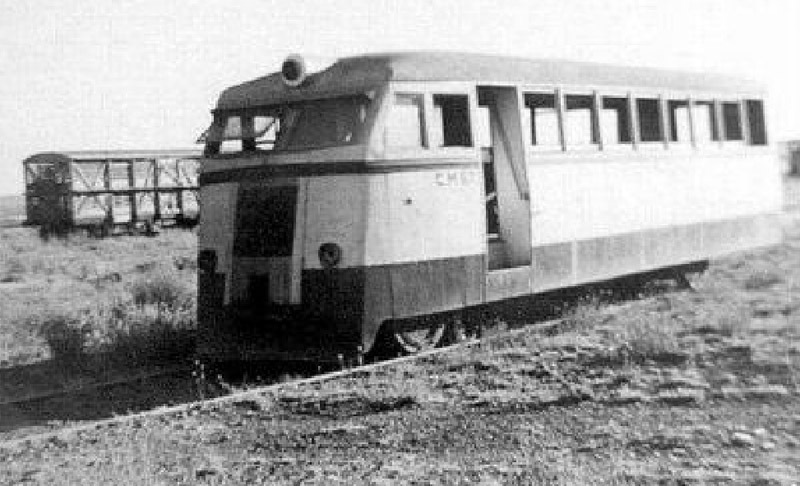 Two buses belonging to the Compañía del Puerto (Buenos Aires) were sent to Puerto Madryn where they were converted into railcars CM66 and CM67. They had built on Leyland Tiger TS6 chassis (said to date from 1930, but the conventional history suggests that the TS6 did not appear on the scene till January 1933) with bodies built by the Compañía del Puerto. They were altered by the removal of their rear open platform, but maintaining the saloon door, adapting the running gear to operate on rails, the provision of sanding gear and skirts. In particular they retained their gear boxes which meant that in service they had to be turned. No provision was made for a coupling at the rear, and so they could not run as a coupled pair (a la County Donegal Railways in Ireland). As a consequence it is said that they were little used in traffic. This view shows CM66 in the original livery of silver grey with a blue band under the windows. The next view shows CM67 in the later livery which was similar to the first, but with the skirts painted blue as the waist band. Later two Drewry railcars (operable in multiple) were brought in to operate the passenger service. 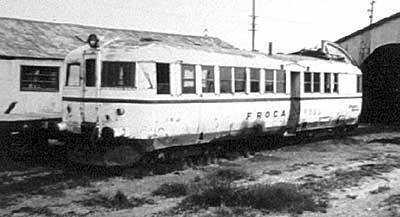 These had been built in 1938 for the FC Sud suburban services in Buenos Aires province, and the FC General Roca transferred a few to Patagonia in 1951. 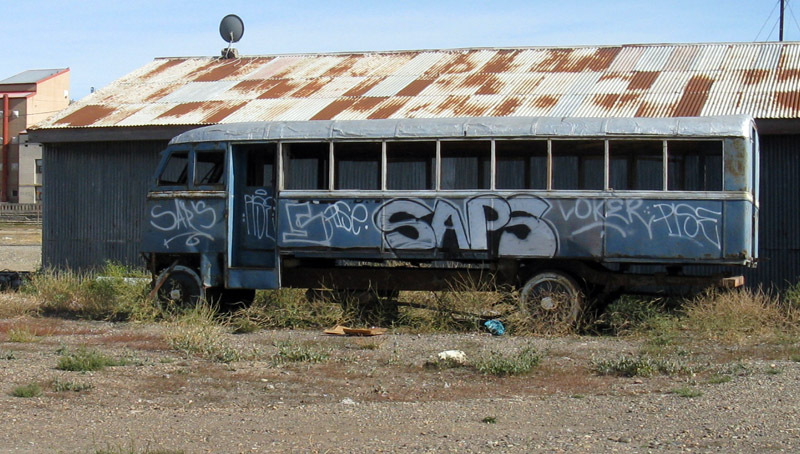 They operated the regular passenger and mail services during the next three decades and became known throughout Patagonia as Las Chanchas (the pigs). They carried 42 passengers each. 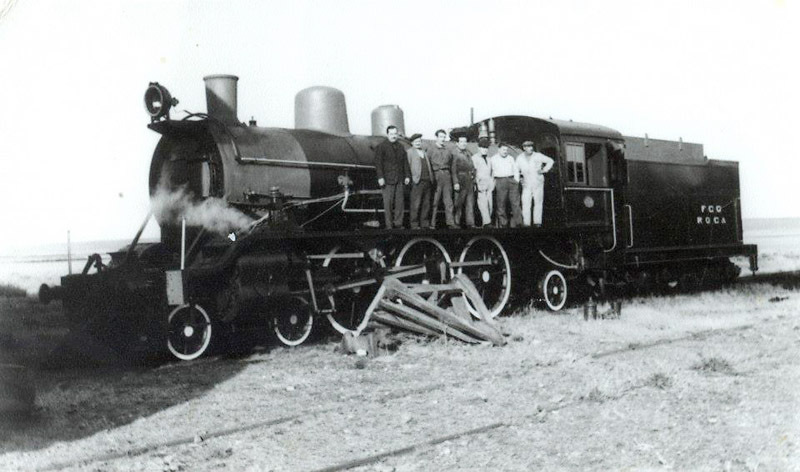 Smaller railcars built at the Puerto Madryn workshops were introduced in 1952 but it is not known how long they lasted. A new Drewry car poses, above, probably in Buenos Aires at somewhere like Liniers. Below, in more battered condition, is a similar car after the FC Genl. 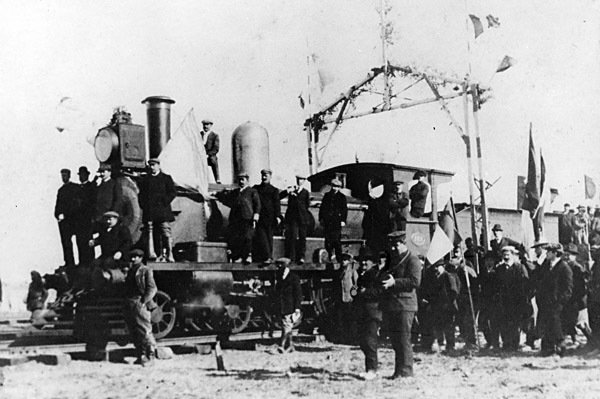 Roca took over the operation of the Patagonian lines. By the 1950s the original Gardner 6LW engines were getting a bit old and the local maintenance staff were begging to be allowed to buy replacement Mercedes lorry engines. However the old power plants had to struggle on until by the end they were forty years old. 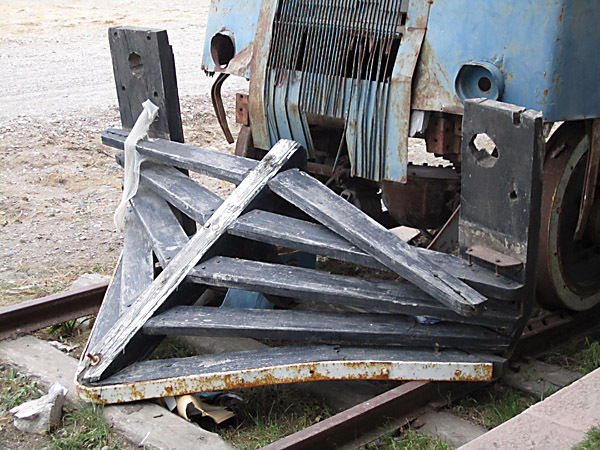 El Ferroclub Argentino is restoring a Drewry railcar in the ex FC Sud workshops at Remedios de Escalada, and there are more Drewrys derelict en the section of the works run by the Metropolitano company. Until I find more photos of trains on these lines it is difficult to build up a clear picture. However there is no shortage of statistics, thanks to the Ministry of Public Works 1913 report () and to Rodney W. Long's report for the US Dept. of Commerce in 1926 (1). This latter was clearly intended to assist American Manufacturers who might wish to tender for the supply of equipment to the Argentinean railways. It is extremely comprehensive. However, its data was supplied by the railways themselves to a large degree and there are some inaccuracies. This information is combined from the two reports mentioned above, and from stock in working timetables/appendices of 1934, 1940, 1945 & 1957. Annual statistics eports suggest that the line had 8 passenger vehicles from 1916 to 1932, and that the numbers then varied between 9 and 8 before dropping to 6 in the early 1940s. None at all are recorded for the years between 1943 and 1952, which is surprising given that the Drewry railcars did not arrive until 1951. Operating in 1956 & '57 and ’60, and to the end? Pto. Deseado drawings book of 1912 preserved in archives at Retiro confirms present in 1912. Not recorded in 1934, ’40, ’45, '56 or ’57. One converted to service car by 1924, and in use in 1940, ’45 & ’57 as 'reservado' R502 with 10 seats, 1 single sleeper and 1 double sleeper compartment. One still in 1st class service in 1945, '56 & ’57 as no. P111. R502 now preserved in Pto. Deseado town centre 2000. P111 now preserved in hospital grounds in Rawson 2000. Pto. 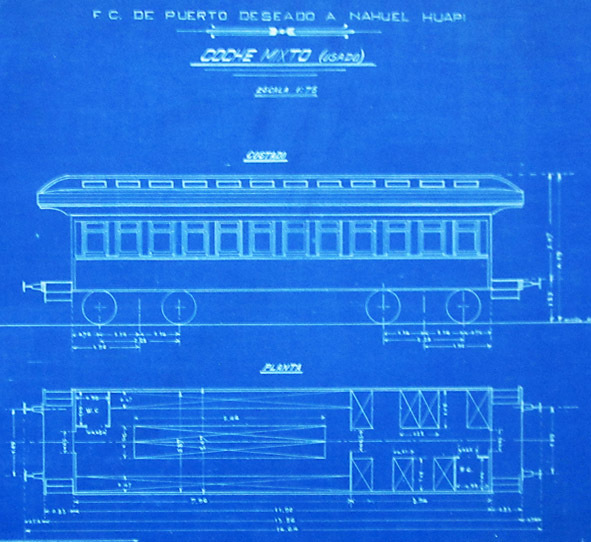 Deseado drawings book of 1912 preserved in archives at Retiro confirms two vehicles. One with bar and only 64 seats by 1924. In 1940 seats recorded as M304 - 1a 28 & 2a 36; M305 - 1a 32 & 2a 54. In 1934, ’40 & ’45 both in use as M304 (with bar) and M305. Both gone by 1956. Both in use 1934, ’40 & ’45, but both gone by 1956. One in use 1934, ’40, ’45, '56 & ’57 as S210. One of these two recorded in 1924 as a mixto. Pto. Deseado drawings book of 1912 preserved in archives at Retiro confirms one was purchased as a mixto. Operating in 1934, ’40 & ’45 as F404. In 1940 with 'cocina bar'! Gone by 1956. 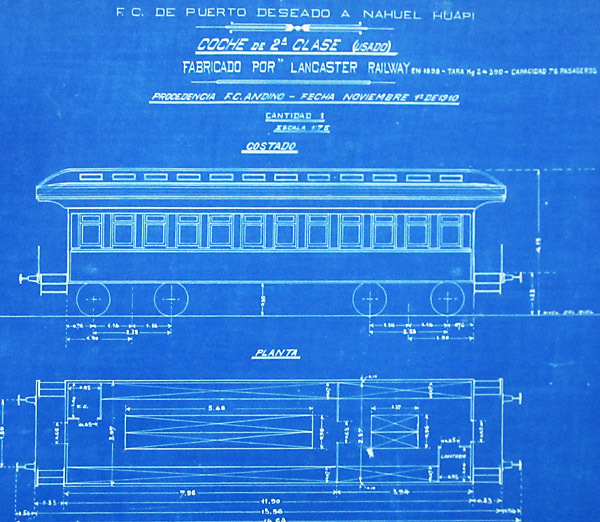 The blueprint volume in the Retiro archives also contains drawings of passenger stock. First class coaches built by Lancaster, originally from the FC Andino. There were two of these at Pto. Deseado. 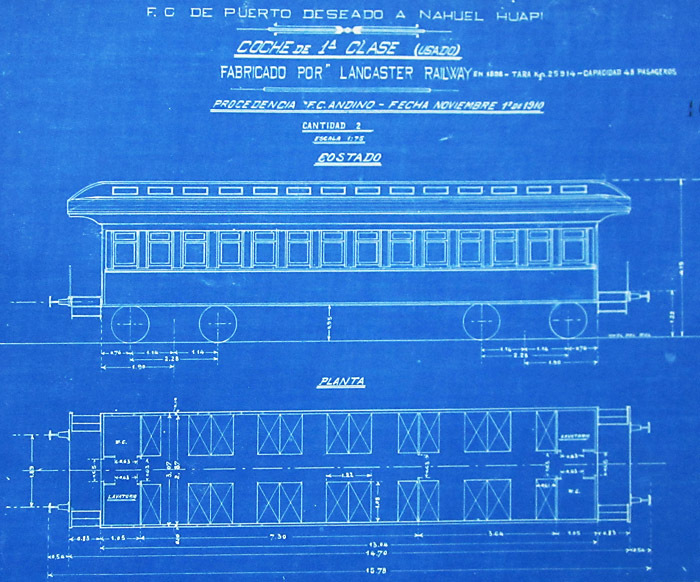 Second class coaches, also by Lancaster and from the FC Andino. Mixed coaches from the same source. The sole example at Pto. Deseado was later converted to 2nd class only. The first class coaches built new for the FCE by Harlan & Hollingsworth. The car below is a Lancaster-built vehicle, No. R502, now preserved in Puerto Deseado town centre. One of the FC Andino axlebox covers on this vehicle, still bearing witness to its origins in May 2011. The data in the table below comes from the 1913 Ministerio de Obras Públicas report () but with extra information from William R. Long's 1924 document (). Info. from 1934, 1940, 1945 & 1957 is from working timetables and appendices. 1952 info is from the 1949 tariff book update. 1956 data is from an FCE data sheet for Pto. Deseado. Down to 52 by 1924, but 4 other similar; only 26 running in 1924 (numbered 2230-2235, 2237-2256). In 1934 2257-68 and 2272-86 were running with open hacienda bodies. By 1940 & ’45 only nos. 2257-2262 were still in this state. Also 25 probably from this series converted in 1936 by Pto. 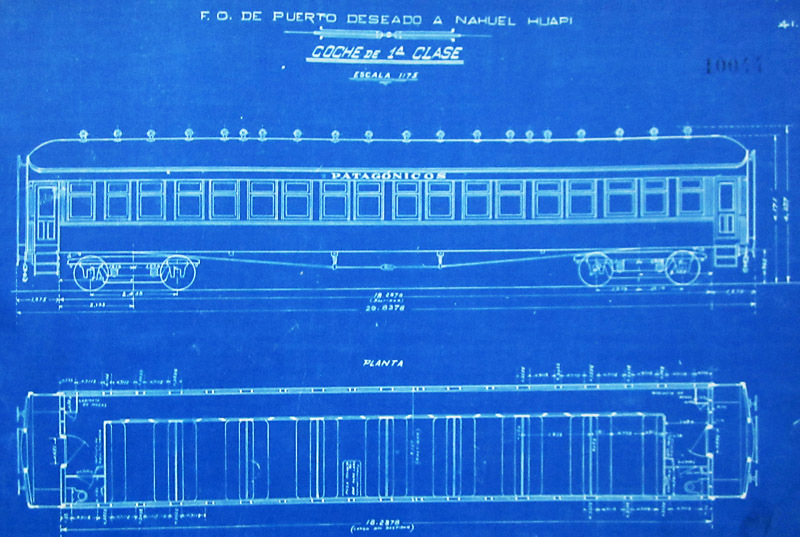 Deseado workshops into Hacienda 2 piso wagons and running in 1945 as nos. 5700-5724. In 1940 nos. 2225-2256 were listed as plataformas without any qualification. The 1952 tariff book update mentions plataformas 2230-56, and also 2257-62 as 'con baranda' ie hacienda wagons. 5700-24 are listed in 1952 as hacienda dos pisos (5703 as 1 piso). The 1955 tariff sheets list 2231-57 as plataformas. In 1957 total down to 25 with nos. 2236, 2243 missing. Strangely the previous year, 1956, was similar but with 2238-41 also missing. 2230 listed as for dismantling. Nos. 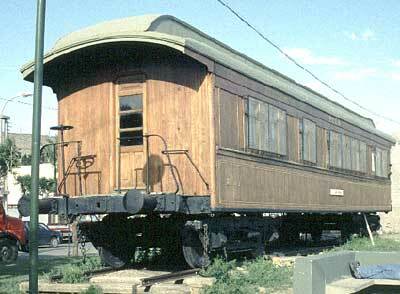 734-7 recorded in 1934 & ’40 as plataformas con barras/baranca para hacienda, and in 1945 as hacienda wagons. In 1952 listed as haciendas/plataformas con baranda. All intact 1924; All 10 in hacienda use in 1934. 5 listed in 1940 as 'plataformas con barras para hacienda', ie. with barriers for carrying livestock (2435-9), & 5 (2430-2434) as just 'plataformas'; and all 10 as plain 'plataformas' in 1945, 1952, 1955, '56 & 1957 numbered 2430-2439. Tare 10.7 or 15 Load 9, 25, or 40 dep. on source! $oro 700,00 each; Nos 2450-1, & 53 are recorded in 1934 as 'plataformas con barras para hacienda' and 2452 as 'plataforma'. None recorded in 1940 & ’45. Nos 312-320 recorded in 1940 & ’52. May have been from same series as Dyle et Bacalan medio cajones listed below. 313-20 still listed in 1955 tariff update. 313, 5, 7, 20 only remaining in 1956 & '57. 'Y.V.R. y Port' whatever that might be. Nos. 465 - 488 listed as out of service in 1934, and 16 more 'sin numeración' presumably never put into service. However, nos. 449-488 listed in 1940 as out of service bar nos 468, 72, 79-80 reserved for vias y obras. By 1956 & '57 20 in departmental service (425-8 for 'playa estacion Puerto Deseado', 429-31 for 'guinche', 432-44 for 'vias y obras'). 20 running as plataformas in 1924; not recorded in 1945. It is possible that these wagons and those immediately above are one and the same batch. 14 running as plataformas in 1924; none mentioned in 1940. in 1945 still 9 in service as numbers 320-329. Note overlap of no. 320 with series 312 plaraformas above. None left by 1956 or '57. 23 running in 1924 plus one each as service car and caboose. Not recorded in 1934,’40 or ’45. 19 still listed in 1934, ’40, ’45 & ’52 (numbered 824-830, 832-833, 835, 837, 839-846) though 10 in departmental use and the rest out of service. In 1956 & '57 18 listed under 'vias y obras' (nos. 824-6, 8-30, 2-5, 7, 40-6). In 1956 827 & 839 'para radiar'. 29 running in 1924; 17 in use in 1934, ’40 & ’45 (numbered 942-953, 964-968) though 3 of these in departmental use. In 1956 & '57 only one in use - 946 for 'vias y obras'. In 1956 nos. 942-4 & 950-1 & 3 'para radiar'. 9 running in 1924; all 10 again in service in 1940, ’45 & ’52 numbered 620-629. 1955 tariff update lists 620-35 as do 1956 data sheet and 1957 appendix! 15 running in 1924; 10 still in service 1940, ’45 & ’52 numbered 723-732 though 725 & 727 modified for departmental use. In 1955 nos. 723-36 listed, though 727 'modificado para equipajes y encomiendas'. In 1956 723, 4 & 26-36 in service, with 725 allocated to 'servicio interno'. In 1957 all listed (without qualification) but 725 allocated to 'mecanica y traccion'. Two groups of five of these running in 1924, and 9 in 1934. In 1940 two groups of steel tanks were listed as 25-9 (smaller) and 30-4 (larger). 10 in total running in 1945 mounted on plataformas no. 2220-2229, including 1 used for petroleum traffic. These had been renumbered 25-9 (steel tanks), 50-2 & 54 (wooden tanks). 2220-9 still listed as tanks in 1952 (with one in use for petroleum traffic). A 1920s photo clearly shows a steel tank bearing running no. 28. It seems likely that tanks from earlier vehicles had retained their running numbers despite being transferred onto plataforma chassis. 1956 list has only 2220 'para radiar'. Listed first in 1955 tariffs update. In 1956 &'57 nos 4517 & 4519 listed as 'tanques para agua' and 4526 still 'para petroleo'. Mentioned in early reports with no details, but probably replaced by 1945 by modified plataformas as listed below. Ex 2200 series plataformas. 25 running in 1940, ’45 and 1952 as 'hacienda dos pisos' except 5703 in 1952 as '1 piso'. In 1955, '56 & 1957 5700-28 listed with no. 5703 still as '1 piso'. $oro 500.00 each. Not identifiable in 1912 list, but present in 1924; one still in 'interventor de estaciones' departmental service in 1934, ’40, ’45, '56 & ’57 as no 559. In service 1934 & ’40 but not in 1945. In 1956, & '57 listed under 'vias y obras' service. $oro 500.00. In service 1934 & ’40 (562 for Vias y Obras) but not in 1945. 561 listed again in ’56, & '57 and 562 in 'vias y obras' service. Possibly like the one at El Maiten (see chapter 7). 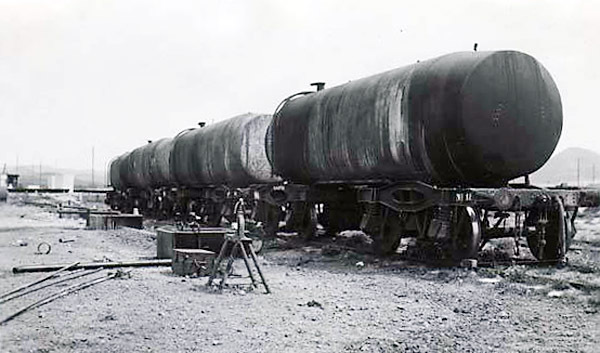 The tank wagons known as 'Patagónicos', with integral frames and a strange design of bogie with pedestal suspension. These were built by Nesseldorf/Ringhoffer in 1910 and were given two-figure running numbers. However, they seem to have diminished in numbers fairly quickly, whilst some were later mounted on plataforma chassis. This suggests that the design was not entirely satisfactory, though no clear evidence has come to light. 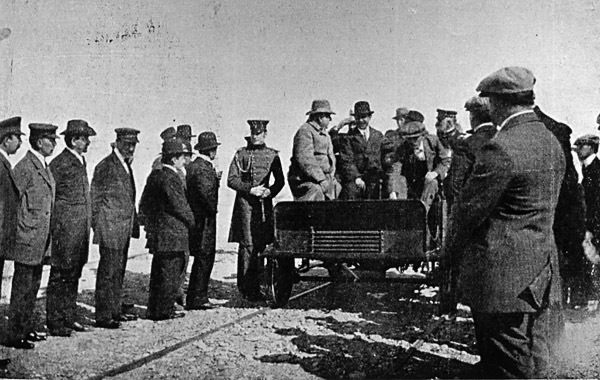 In 1912 The president of the Argentine Republic, Señor Roque Saenz Paena, came to visit Puerto Deseado. 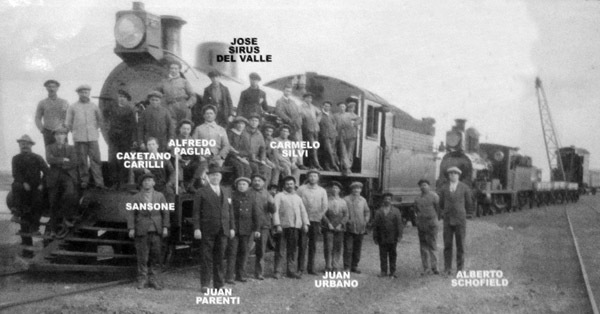 The photo below, from Argentina Austral magazine, shows him travelling on the railway in an early Drewry internal combustion engined inspection trolley. It seems likely that the lightweight turntables, such as that surviving in June 2011 at Fitz Roy, below, were for vehicles like that above and their successors. By 1945 the Drewry had gone, but in its place were a home-built inspection car with a 40hp engine, and two 'zorras' by Fairmont of the USA. In 1957 three Fairmonts (nos. 21-3) were used by 'vías y obras', and two 'automoviles' were listed under 'mecánica y tracción (no. 21 built Talleres Pto. Des. probably the one listed in ’45) and 'vias y obras' (no. 23, built Talleres Com. Riv.). 1956 had had an identical list though strangely 'automóvil vía ' no 23 was listed as no.22, and it was stated that it had previously been coche motor no 3 at Comodoro. 1 The railways of South America - Part 1. 1926. Rodney W. Long. US Dept. of Domestic & Overseas Commerce. Washington DC. 2 The World of South American Steam. 1974. Ken Mills and Roy Christian. Published privately, California. 3 The Railways of South America - Part 1. As above.